Exports of Swiss watches to the United States look likely to move back into growth this year. The Federation of the Swiss Watch Industry says that exports to the US dipped by just 1.9% in January, a dramatic improvement on the year-on-year drop in December of 9.5% compared to the same month in 2016. The January result is a lagging indicator of strong sales over the holiday season, and a willingness for watch retailers to re-stock. Swiss watch exports in January totalled CHF 163.1 million, the same figure as in December. Annually, 2017 was a transition year for the United States with imports of Swiss watches falling by 4.4%, a far better result than the 13% slump of 2016. Hopes for the US market come in a month when the Swiss watch industry is bouncing towards Baselworld with a spring its step after global export figures delighted executives. Strong sell-through over the holiday period had retailers reaching for their cash in January, with total global exports for the Swiss watch industry rising year-on-year by 12.6% to CHF 1.6 billion. Asia has roared back to life, with monthly exports to Hong Kong rising by 21.3% while sales to China leapt by over 44% compared to January 2017. The UK remains the world’s fourth largest export market for Swiss watchmakers, with imports worth CHF 91.6 million in January 2018, an annual rise of 4.6%. France was the best performer in the eurozone, with imports rising by 19% in January to CHF 74 million. 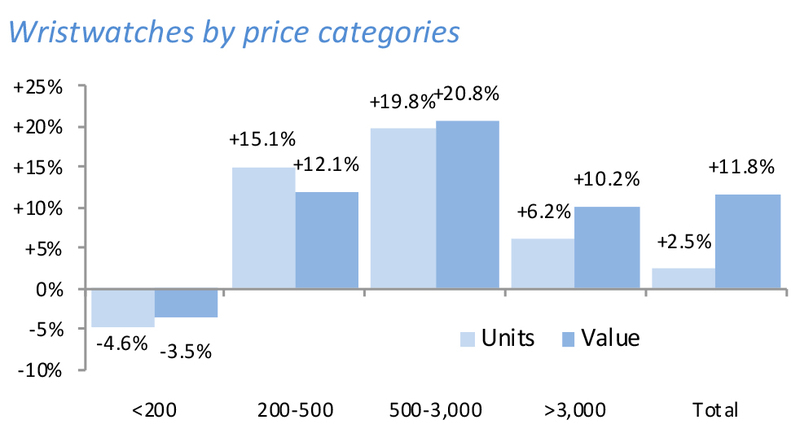 Luxury watches outperformed less expensive pieces, with the value of global exports of watches priced at CHF 500 to CHF 3000 rising by almost 21%.